Becca kicks it at BU CrossFit. CrossFit Level 1 Certificate Courses: CrossFit Fort Bragg, CrossFit Fort Walton Beach, CrossFit USD, CrossFit Atlanta, Reebok CrossFit One, Reebok CrossFit One SWAT, CrossFit San Diego, CrossFit Del Mar. CrossFit Competitor's Course: Outlier CrossFit. 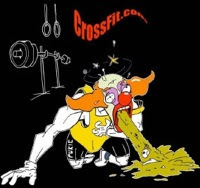 CrossFit Coach's Prep Courses: US CrossFit, CrossFit East Village. Softball enjoying the daily WOD at BU CrossFit. Medball-Handstand push-up Event, 2012 Reebok CrossFit Games. The 2012 Reebok CrossFit Games continues on ESPN2 tonight starting at 10pm ET and tomorrow starting at 8pm ET. Yurii Hanson 3:06. Post time to comments. How could this athlete improve his swing? who is currently on his 5th deployment to Afghanistan." "Survival of the Fittest: The Future of CrossFit's Innovative Model" by Nancy McGuire Choi, The Huffington Post. Julie Foucher at the Pendleton 1 checkpoint, 2012 Reebok CrossFit Games. The 2012 Reebok CrossFit Games begin airing on ESPN2 starting tonight. SPC Brian Pomerville at the grand opening for CrossFit Walter Reed. The 2012 Reebok CrossFit Games begin airing on ESPN2 starting Tuesday, September 11 at 10 p.m. EST. Post total hang cleans and total push presses to comments. CrossFitter Will Johnson starting for the Pittsburgh Steelers this year. Dadi Runar, Mt. Spakonufell, Hunafloi, Iceland. Click for information about The Travis Manion Foundation and the 9/11 Heroes Run. CrossFit Level 1 Certificate Courses: CrossFit Virtuosity, CrossFit King of Prussia, Norcal CrossFit, CrossFit SS, Rogue Fitness, CrossFit Strong, CrossFit Forever Strong, CrossFit Parma, CrossFit Melbourne, CrossFit SAP. CrossFit Coach's Prep Course: CrossFit Park City. CrossFit Kids Course: CrossFit Reebok Stockport.